On Gozo News.com September 21: "Minister Evartist Bartolo and H.E. Dr Joe Vella Gauci, Ambassador of Malta to UNESCO, will be opening the major conference on digital libraries for Europe – International Conference Theory and Practice of Digital Libraries (TPDL), the 17th edition of which is being hosted on Monday at the Hotel Excelsior in Floriana. The event is being held under the patronage of the National Commission for UNESCO – Malta, and is co-organised by The Department of Library Information and Archive Sciences of the University of Malta and the COST office of the EC (European Cooperation in Science and Technology). The opening ceremony will also include welcome addresses by Professor Henry Frendo, Chairman of the National Commission for UNESCO in Malta, Prof. Joe Friggieri on behalf of the University of Malta, Prof. Janet Mifsud on behalf of COST, and one of the programme chairs, Prof. Trond Aalberg from Norway. The conference will host some 300 delegates from 40 countries from all continents, including academics and representatives of memory institutions. The conference has many distinguished delegates, deans of information schools across the globe, and representatives of the EC, UNESCO, the Council of Europe and other international bodies." read on. 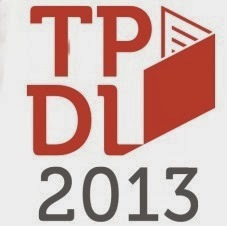 TPDL takes place September 22-26, 2013 at the Grand Hotel Excelsior, Valletta.